Jem Withington~ Halloween is amazing and special at Disney. We don’t really do Halloween in the UK so it’s so much fun in Disney. I love Christmas in WDW too….probably to close to call. Jennifer Goldbach Lomassaro~ My favorite is Christmas. It’s just so magical. I just love the feeling I get when I’m there at Christmas time. I just get tingly all over. Jody Richards Gouldsberry~ Couldn’t decide what I liked better so coming for both! Jaymi Cannon-Palmer~ I prefer Christmas because it’s my favorite time of year and to spend it at Disney combines my two favorite things! I enjoy Halloween too, but Christmas has my heart. Fran Randazzo-Hesse~ I Love Both. I have to admit I Love MNSSHP More Then MVMCP! I do like the Christmas Party but Halloween is my favorite. Jennifer Bryan Gossen~ I never cared for Halloween until we moved to Orlando and started going to Disney for Halloween. I love the well-decorated, ‘cute’ Halloween style. I’ve also been to the Christmas party, but Halloween is my favorite. It gets me in the spirit for Thanksgiving and Christmas. Holly Balasia~ Christmas because it means family to me! Jennifer H Tuck~ Halloween…. Best parade EVER, at the party! Dawn Carney~ Seriously Michele I CANNOT choose. Halloween means fall is here and Disney does an amazing job decorating. And the treats are to die for. Then there is Christmas, the trees are to die for. And Mickey and Minnie are just gorgeous all dressed up for either holiday. 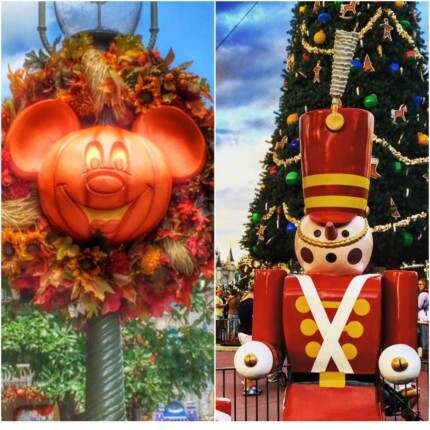 Sherry Rinaldi DeHart~ I love Christmas but Halloween at Disney was amazing!!! Trick or treating as our favorite characters in the Magic Kingdom was the best. We are from NY and usually have to wear layers of clothes under costumes, and coats over them. Not having to do that was great! The Halloween parade was boooootiful!!! Jesse Lee Newcomb~ Christmas is so beautiful but the Halloween party is just so special and the only time you can really interact with the villains. So Halloween for me. Kelly Louden~ Gosh, I adore them both. I’m not sure it’s fair to compare them. They evoke such different feelings for me. I will say that of the two parties that they offer, we much prefer Halloween to Christmas parties. Mara-Lynn Fahey~ We’ve never seen WDW at Halloween (in person), but the magic that happens at Christmas is beyond description! The decorations are beautiful and themed for each venue and it SNOWS… on Main Street… and it looks and feels like real snow! Layne Smith~ Both but for different reasons. Just love Halloween and have my whole life. But Christmas doesn’t feel like Christmas without a trip to Disneyland. Michelle Gilbert DeDecker~ That is such a hard question. I have done both seasons in the last couple years. Loved them both. But I guess Christmas. There is something magical and festive about hearing the Christmas music over the speakers and seeing the additional gorgeous decorations around the property. You can’t help but feel the spirit of both Disney and Christmas. Frank Marando~ I love both Halloween & Christmas at Disney World. As I’ve said many, many times, there are no seasons in south Florida. Trees don’t lose leaves and temps don’t change all that much. Going to WDW to actually see the decorations of the seasons just feels right.